Our sister agency, PKG, developed amazing new packaging for State Fair Brand. So it made sense when the brand turned to us as its new digital and activation agency. We have some history with State Fair, and we know that because the brand is part of a portfolio of major national brands, we needed to make the most of a limited budget. These days, brands need to extend their reason to believe online with unique content, accessibility across multiple devices, organic cross-platform integration, and greater emphasis on encouraging dialogue with consumers. Meanwhile, consumers are online with the device most within reach. More often it’s a phone or tablet. Flash-based sites, like State Fair’s, weren’t designed for many of these devices. We knew we could fix that. And evolve the site in the process. 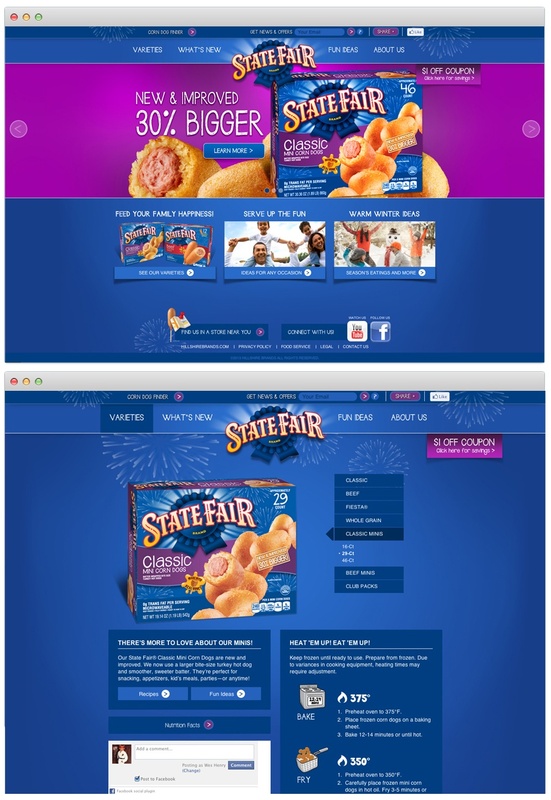 In 2009, we began a partnership with State Fair by upgrading the brand’s microsite, turning it into a content-rich and immersive online headquarters for corn dogs. To accomplish that, we benchmarked the competitive set, as well as brands State Fair consumers admire. Surprise! Consumers wanted product information, cooking instructions and nutrition facts. Working with brand on the “Dream Home” activation, in 2009-10, we learned more about the State Fair shopper, including insights she shared with us in “Dream Home”’s development, execution and post-measurement. Four years later, these needs still hold true. But as technology and access to information has changed, the need has evolved. Consumers want brands to value their opinions and celebrate their loyalty, and brands must harness the power of social media and integrate functionality into their online strategy. From enabling likes and shares, and providing comment boxes throughout the site, to crowd-sourcing their fans for product ideas, serving tips and feedback on Facebook, brands are finding success in empowering their consumers with simple ways to advocate their loyalty. When we launched a complete web redesign for State Fair in 2009—along with a timely FSI—with recipes and themed serving suggestions that helped consumers find more opportunities to serve State Fair, we saw traffic hit nearly 3,500 visitors in one day. In 2012, we tore it all down, offering the brand a new online strategy tailored to meet today’s consumer demand, with a holistic integration between State Fair’s Facebook and web platforms. With State Fair’s Facebook page, we found new ways to influence consumers to interact with the brand. The Facebook page is monitored daily, which means more focused interactions with its social community, including the development of a rich resource of fan-created recipe suggestions. 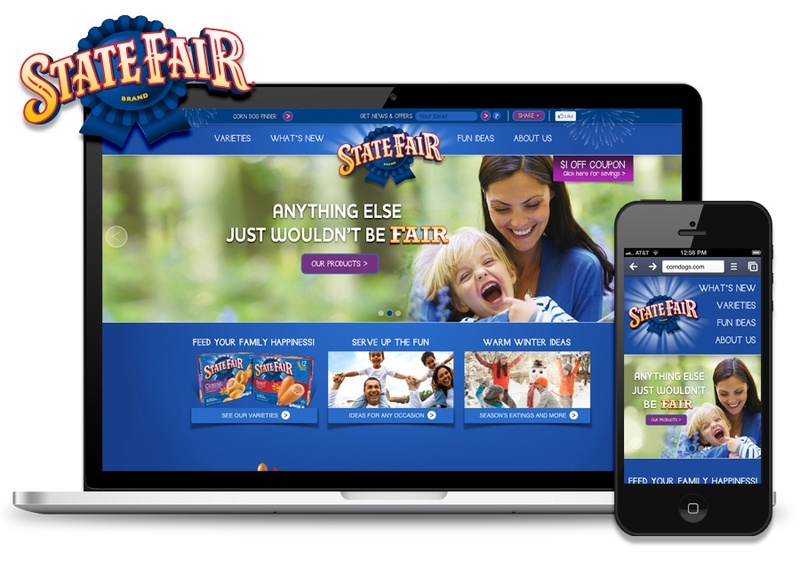 Then we redesigned State Fair’s website to be more accessible to more consumers, more often. The new StateFairBrand.com takes advantage of the latest in responsive technology—one rich site viewable on a desktop, laptop, tablet or phone. The site’s so smart it knows device type, automatically adapting size and shape accordingly. Because we built the website to be one responsive site, updates are easy and the user experience is seamless across interactions. The new site also integrates Facebook functionality, enabling consumers to like, share and interact directly with the brand. And the site showcases seasonal and occasion-based content that’s driven by both consumer feedback and targeted posts on the brand’s Facebook timeline. Both platforms help drive traffic between them. The brand’s Facebook page gained 3.5% to 46,600 fans in less than 4 months. Each post is read by an average of 12% of the brand’s Facebook community. Also in the past four months, 178 fans engaged with the brand’s most popular post by liking and commenting. StateFairBrand.com re-launched in January, 2013 and we’re looking forward to checking the analytics soon!